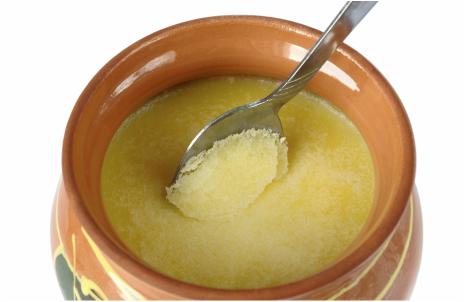 Ghee is the Indian version of clarified butter, with the milk solids removed, giving it a translucent yellow colour. Although ghee was traditionally produced with butter made from water buffalo milk, today, most people use everyday cow’s milk. The best butters are those with the highest fat content (82% or more) and you should try to make sure your butter comes from grass-fed animals (higher Omega-3 levels). The very best quality butters are made using un-pasteurised milk (it’s simply not true what Benny Hill once sang… that ‘pasteurised was best’). As it is heated for a longer period of time, ghee develops a stronger, nuttier flavour and acquires a darker colour than clarified butter. Its high smoke-point of around 250 ͦC is higher than that of clarified butter meaning it is both nutritious and good for frying. Plain butter already begins to smoke at around 150 ͦC. Well prepared ghee is also virtually lactose free and can be tolerated by most people with allergies. Melt 500g of unsalted butter in a pan and while stirring continuously, bring to the boil. Leave it to simmer very gently for around 30 minutes before taking it off the heat and skimming the scum (milk solids) from the surface. Leave it in the pan for two or three hours to cool completely, but don’t let it set. Then pour into a clean jar or other container and seal tightly. Throw away any sediment remaining at the bottom of the pan. Incidentally, you can also make flavoured ghee by adding spices such as cumin or ginger to the butter at the start of the cooking process. Your ghee will keep in the fridge for six months or even longer. Since the milk solids have been removed, ghee doesn't go rancid like ordinary butter begins to when it isexposed to the air (nb: keep normal butter covered or wrapped at all times), so refrigeration is not essential. However, it will extend its life, so on balance, I suggest keeping in the fridge. TIP: The French like to preserve butter at room temperature in a butter keeper containing cool water which keeps the butter fresh. That way, you can safely leave it out on the table for cool yet easily spreadable butter.